Lowdown: A person finds himself stuck in a struggle between regular people and those whose brains have been enhanced by computers. One of my criticisms, for lack of a better word, towards Daniel H. Wilson’s previous book, Robocalypse, has been that its point is likely to be moot: long before computers and humans will start to physically contest one another, I foresee computers being integrated into us humans. That is, even more than they are now, when my smartphone is an integral part of my hand. Wilson seems to have heard me, and his latest science fiction book – Amped – talks about that instead. Only that Wilson opens my rather naïve eyes more than a bit: if I expected the integration of man and computer to be a smooth and welcomed one, then the realities of this world we live in and of human nature imply that this transition will not be smooth at all. In our near future people with problems such as epilepsy or ADHD receive a brain implant – a small computer – that makes sure their brain is on track. That computer not only solves their health problems, it also turns them into geniuses in comparison to their peers. In other words, they are amped! Those regular people don’t like being overrun, especially not by those they used to recognize as weaker; a struggle ensues. Amped explores this rather unsmooth transition through the eyes of a schoolteacher, Owen. First an amped student in his class jumps off to her death; then he finds out from his father that his own amp packs more than he had been led to believe. And then that father dies in a car bomb aimed at the facilities where amps are being “installed”, just as the US courts determine that amps have no human rights anymore. What follows is an adventure story where Owen has to find himself, his identity in this world, and a way out for the country around him as it seems hell bent on a second civil war. The resulting story is open to interpretation in various ways: at its basic level it is a story about the struggle of amps for equal rights, a story not unlike that of Robocalypse’s. Alternatively, Amped offers us a story about a prosecuted minority and its abuse, a story not unlike what black minorities had to go through. Then there is the book’s clear attempt to use the core of the conflict in order to criticize contemporary American society and the way it goes about, particularly in comparison to the way Europeans societies go: to use the terms set forth in Twilight of the Elites, Amped is criticizing the American obsession with equal opportunities while totally ignoring the matter of equal outcomes. The problem with those multiple agendas is that the result suffers from a mild case of neither here nor there. Couple that with a severe sag in the book’s “second act”, that’s made worse by a somewhat deliberately ambiguous way of describing events (a point on which I am sure many would disagree), and the result is a book I am somewhat hesitant to recommend. Amped is not the straight out action kick that Robocalypse offered; it tried to be more, and in many parts it is quite a page turner. I, however, could not avoid feeling it tried to jump a hurdle too far. 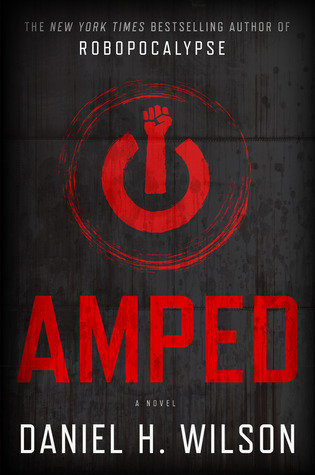 Overall: Amped puts some worthwhile ideas to the discussion board, but its execution is somewhat suffering. 3 out of 5 stars.